It is true, the larger / older the tree, the better they can withstand frost. The larger trees (from 20cm. Girth) to -12 degrees Celsius tolerated for a short time. However, with smaller trees, and if the frost is a longer period of time persists, there may be the best to be taken several measures. Long periods of frost, for example, cause leaf drop. If the tree is not too large it can be put away some sheltered. For example, under a canopy in a corner. The tree can also be protected by well to get hold of in the root ball or pot. This can be done with the potbescherming. The root ball should keep the tree namely alive. To keep maximize the chance of blade retains severe frost and possibly better recovery you can pack up the crown. Note that there is still sufficient airflow. Preferably with special winter fleece or protective covers. 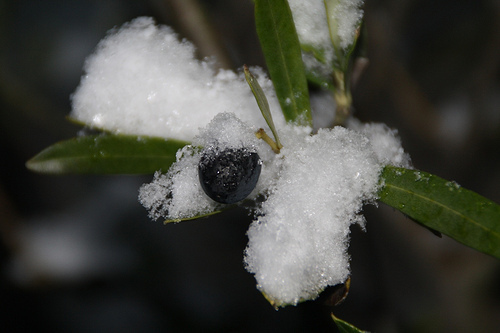 If you have an olive tree can be placed into a greenhouse or “cold” garage possibility. They do need light and will receive about 20% percent leaf drop by acclimating. Trees planted in a greenhouse or shed must not dry out. Sometimes can not be avoided that the tree leaf drop. You do not immediately think that the tree is dead then. In most cases, the trees in the spring will again form sheet. The Bergerie has in that case good fertilizer tablets to boost the tree again. These are easy to order in our nutrition shop. To check whether your tree still has a good chance, you can put a scratch in the spring at various places in the bark. It should be seen fresh green wood. It should be fit for large temperature differences. So do not place your olive tree once at home during the frost.